With over 59.4% of market share and covering over 26% of the web, WordPress is a sure-shot market leader in the world and the top CMS platform. Today, over 50% of blogs and websites in the world are running on WordPress. It is packed with innumerable features. Most of the publishers and writers agree to the fact that its content editor is not that simple. The major turn-off is that its editor doesn’t have support with several features that editors and writers need. But it is going to change forever finally. WordPress is used to create content for most blogs on the web. But it is not always easy to go directly to WordPress. Some users prefer to create content anywhere else and then transfer it to WordPress. The process of doing it is very annoying. Instead of giving competition to Google Docs, WordPress has finally embraced the well-known web editor. 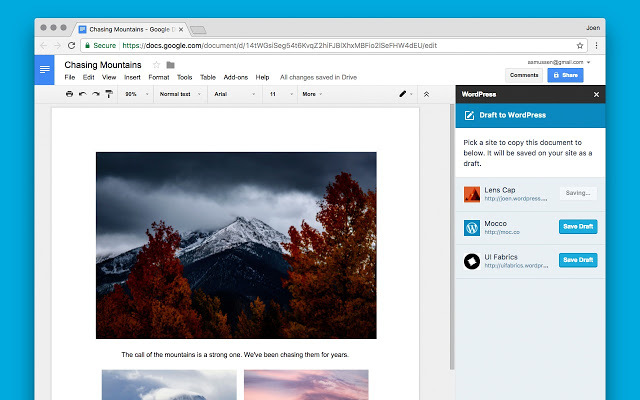 Now you can publish and write directly from Google Docs. It is going to be the whole lot easier for the editors to collaborate with other users. Google Docs is the real-time, default collaborative editor. Up to the quarter of the web development world is based on WordPress. WordPress interface has been used by millions of people on daily basis to write posts on the blogs. Despite having a minimalist mode and highly customizable admin interface, WP is still failed to hold people from using other services and apps to write their drafts. Some people use Ulysses, Word Documents, and Google Docs. The major drawback in WordPress is that you cannot collaborate on it in real time. If someone wants to check the content before publishing, the author needs to leave the editor so one can start editing. In that case, Google Docs is more convenient as several people can edit one document at a time. But copying and pasting a draft to WordPress is really very tiresome if you need to do it on daily basis. You may also need to upload pictures and reformat it last time before you publish it. With the powerful REST API, WordPress has made it possible to collaborate with third-party services. How to Use this New Feature? With this new feature, you can easily send a draft to your site. The images and layout will be carried to the draft and you can also update it from Google Docs. First of all, you have to install Google Docs add-on. It is an open source extension, obviously. You can use “Add-ons” menu in the extension in Google Docs. Once your WordPress site is connected, you are all set. Now you can write a draft in Google Docs, add images, links, and headers. You can save it all at once to WordPress once you are done. This extension will not access any other documents saved in your Google Drive. It can access only those documents that are integrated with your WordPress account. It integrates with any WordPress platform with Jetpack. If any post in WordPress is modified since the last time it is opened in Google Docs, the best thing is that the extension will notify you about that. It also enables you to draft several times using Google Docs. Nothing is going to change if you don’t want to. It is merely an innovative way to write your drafts and publish on the WordPress.com site. A few years ago, Automattic has also owned Simperium and Simplenote. Looking to build a WordPress powered blog Website? Contact WordSuccor Ltd. It is actually an official extension from WordPress titled as “WordPress.com for Google Docs”. It is now available for download. 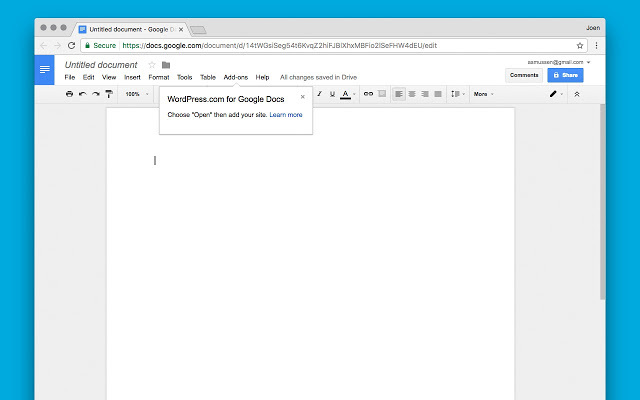 After installing it, users can now edit and write on Google Docs directly without accessing CMS editor. With just one click, users can now import the draft from Google Docs to WordPress. It saves the users from the hassle of copy-pasting the content. According to WordPress, “Import option can carry all the pictures and content while keeping the formatting intact”. Indeed, it is a boon to all the editors and writers. Another best thing about this extension is that it can get the most of real-time and powerful Google Docs collaboration. All the members can now work without waiting for a writer to exit the editor so others can make changes. In terms of collaboration, there is nothing better than Google Docs. In addition, it also creates preview URL just in Google Docs. This way, you can preview the post on the blog without visiting the CMS separately. 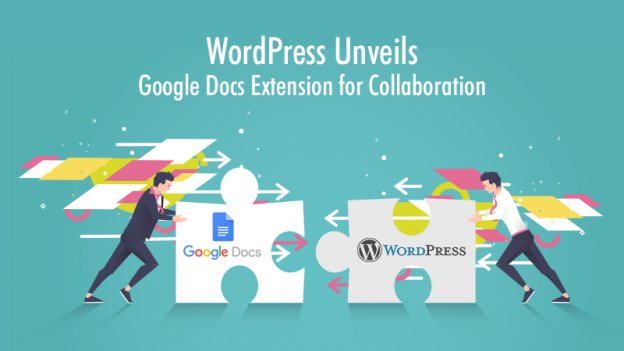 The extension “WordPress.com for Google Docs” will support all the WordPress sites with Jetpack and WordPress.com sites”. If you write for several sites or blogs, you can easily connect all by switching them. You can get this extension from Chrome Web Store and it works on Chrome browser only.